I know I have already recently done a writing prompt about earth elements, but I think it's important to be connected with them. This is a water connected girl. I always have been, and it's been a huge source of inspiration for much of my writing. I include this element in everything I write. I remember sitting on the dock when I was young, crossed-legged...eyes closed...and just listening to the water ebb up to the shore around me. My favorite times were when the waves would come crashing around me, or when I'd either be floating on top of the water's surface or even on a water mattress. Water can be deathly as well as comforting, but like all earth elements you need to know how to connect with them. So, I am giving you those thoughts for your writing prompt today. As I said, I know we've done this one recently but I think it's important today. 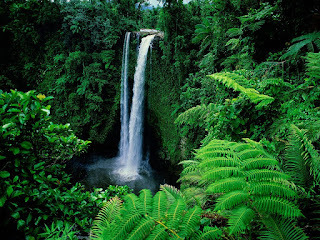 And if I could sit somewhere surrounded by trees, listening to a waterfall right now, I'd be in seventh heaven. Have a good writing day!